I don’t know if I am cheap or frugal, or even if I am a tightwad (probably not, given that while I hate shopping do not mind spending) but I am almost always interested in different ways of doing almost anything. One specific example of this is my use of hot animal hide glue, and the means of cooking it. Glue is available at most woodworking retailers, but I buy mine in bulk from Milligan&Higgins in 50lb. bags, thus saving about 75% over individual 1 lb. bags. Properly repackaged and sealed, dry granular bulk glue is good for a very long time. When it comes to cooking glue, commercial glue pots are available for upwards of a hundred bucks but I am disinclined to buy them when perfectly serviceable options are available cheaply. In fact, I prefer these methods to the commercial glue pot. My source for all of my glue cooking implements is a variety of flea markets, thrift stores, and yard sales. Crock pots, especially the smallish ones used to stink up the house with potpourri, are darned near perfect as glue pots. They certainly get hot enough to cook the glue without making it too hot, their ceramic shell is a great reservoir of heat allowing you to take the pot to the work if needed without losing all the heat at once if you have to unplug it, and they are cheap. I have several, and make a point to buy more whenever I find them. I’ve never spent much for one, and mostly they are in the fifty cents to $2 range. The only time I spent $5 was as a donation at the Humane Society Thrift Store. Another wonderful option for preparing very small amounts of glue is the coffee cup warmer, which comes complete with a ceramic cup at many dry goods stores, but are also available from the same places I buy my mini-crock pots. A small glass jar with glue can be heated directly on the warmer, which works just fine for doing the small scale gluing I need for most restoration projects. A third tool for cooking glue is the fondue pot. I have a couple and like them very much. Fondue pots have the advantage of getting a little hotter than either the potpourri crock or the coffee cup warmer, plus the cheese pot is usually just sitting on the heater coil and can be easily moved for working elsewhere in the shop. 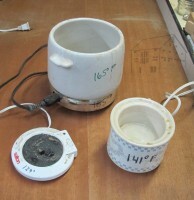 The mini-crock, the coffee cup, and the fondue can be used to heat glue directly or with a water jacket with the glue in a second container. In fact my most frequent method is to prepare my glue in a small canning jar and place it into a crock filled with hot water. One thing I do after acquiring a yard-sale cooker is to plug it in with a container of water inside and wait for it to reach full heat, then measure the temperature of the cup of water it has heated. I write that temperature on the outside of the cooker so I know exactly how hot my glue is getting.